Idam Lee is a nonindustrial world, that requires extensive imports of outside technology to maintain a modern, star-faring society. 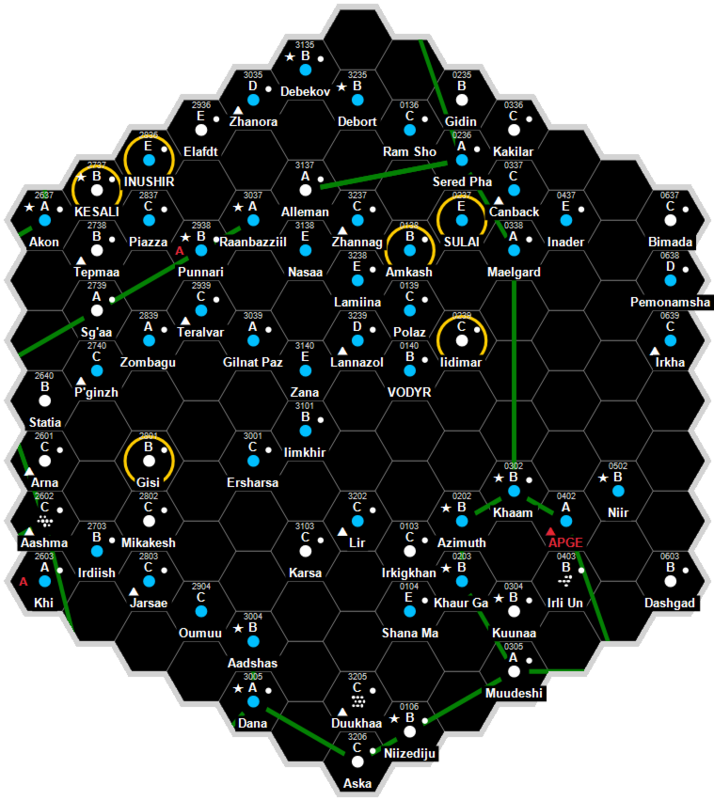 It is a Non-Aligned world dominated by human sophonts located in the Tri-Empire Subsector of Glimmerdrift Reaches Sector. Idam Lee has a good quality starport. A Class-B Starport Facility has not very well developed shipyards and is only capable of producing spaceships. This facility has many very skilled personnel who can perform not only major repair work, but overhaul work as well. This facility has advanced refueling and refining infrastructure. One may purchase practically any kind of refined fuel here. Almost every starport of this class possesses both a Lowport and a Highport. Such ports rarely have more than one of each kind of port. Idam Lee possesses a Technology Level of TL–0. These worlds often contain a Proto-Sophont species beginning to establish a nascent civilization and society. This world is in its Alpha Period and has not yet been interfered with by a higher technology civilization. Common Communication technologies for this TL include: Bodily communicative apparati, courier-runners, and smoke signals. Common Power Generation technologies for this TL include: Bodily muscle. Land: Bodily locomotion, riding beasts, and litters or sedan chairs. Water: Swimming, rafts, and canoes. Air: Typically not available unless a bodily ability. Idam Lee has no well-defined government structure. In many cases, tribal, clan or family bonds predominate. The typical power source of this government is an Pantocracy or Chaos. The typical power structure of this government is a Confederation (Anarchy). Dave Sering, Steve Crow. Glimmerdrift Reaches (Judges Guild, 1981), TBD. Marc Miller. "Wars of the Imperium." Imperial Encyclopedia (1987): TBD. Martin Dougherty, Hunter Gordon. Gateway to Destiny (QuikLink Interactive, 2004), TBD. This page was last modified on 6 June 2018, at 08:15.